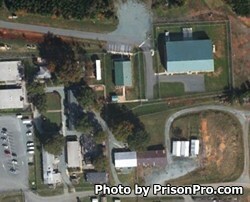 Orange Correctional Center is located in Hillsborough North Carolina. It is a minimum security prison that can house up to 200 adult male offenders. Offenders are held in open dormitories. Inmates have access to religious activities through the Chaplains office, books through the library, and are given basic medical and dental care. Orange Correctional Center has several job assignments inmates may participate in. Off site jobs include working on road crews for the Department of Transportation, and performing various supportive roles for local government agencies. Internal jobs offered at the prison include landscaping, laundry, custodial and building maintenance, kitchen duty, and working in the library. Some inmates may even qualify for the work release program, which allows the offender to work a job within the surrounding community during the day, and report back to the prison at the end of their shift. Additional programs offered to inmates include substance abuse treatment and the transition program, which helps prepare inmate's for their upcoming release. Visits at Orange Correctional Center are held on Sundays in two sessions, a morning session from 9am-11am and an afternoon session from 2:30pm-4:30pm. The session your inmate is eligible for visits will depend on the first letter of their last name. This schedule rotates every three months so you will need to call the facility for the current rotation.